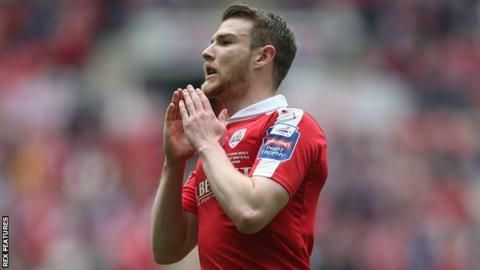 Barnsley striker Sam Winnall has targeted winning the League One play-offs after their Johnstone's Paint Trophy Final success last Sunday. The Tykes came from a goal down to beat Oxford 3-2 and win the competition for the first time in the club's history. Paul Heckingbottom's side are seventh in League One, four points outside the play-offs but with a game in hand on all the teams above them in the table. "It's the motivation of knowing that we could do it all again in May," he said. "That's something that is all I'm focusing on now. I've tasted what it's like to win at Wembley and I just want to do it again as soon as possible." "I actually wanted to do that because I didn't want to miss the celebrations," he told BBC Radio Sheffield. "I had every faith in the boys that they'd get the job done. "I just wanted to go in, get my drug test out of the way and go back out and enjoy the celebrations, and that's exactly what I did."